BMW M Division is the master of toying with magic these days. Here is the brand new BMW M4 we’ve been driving for less than an hour, at 100km/h on Melbourne’s Monash freeway while the official launch is still happening in New Zealand, and the trip computer is reading 6.8 litres per 100 kilometres. This is not the first figure you want to read about in a comparison test of the BMW M Division’s newest two-door, but it’s all part of the smoke and mirrors act we’ve seen before on the BMW M5. 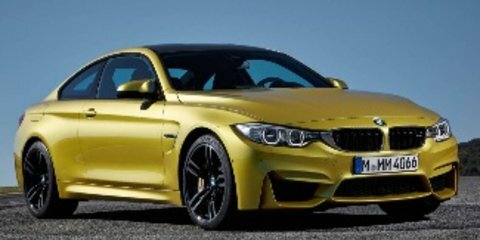 It can turn from comfortable executive express to hard-edged muscle sedan depending on your mood and its driving modes, and so when we get to the good roads soon, we’ll be ready for the M4 to remove its cloak. So the BMW M4 replaces the M3 coupe, the iconic nameplate of which is now reserved for a sedan bodystyle that’s marginally heavier (by 23kg) and taller (up 40mm), and $10K less expensive than the $166,430 model we’re driving here. BMW has retained a six-speed manual (with a rev-matching facility like that in the Nissan 370Z), but it won’t cost you any extra to buy the seven-speed dual-clutch automatic except for adding 40kg in mass to total 1537kg in coupe form. The big news relating to that outstanding freeway fuel figure is the switch from a 4.0-litre V8 engine used in the previous 2008 E92 M3 to a six-cylinder motor as used in the 1999 E46 M3 the generation before. That latter model had a 3.2-litre swept capacity, however, where the new M3 and M4 remove the ‘2’ from that figure and use it to designate how many turbochargers there are – up from nought in every M3 before now. Not only does the new M4 coupe weigh 100kg less than the old M3 coupe, but its power figure rises from 307kW to 317kW produced between 5500rpm and 7300rpm. Before you had to wait until 8300rpm for that lesser figure to arrive – just 100rpm shy of engine cut-out – yet now the highest the new engine can go is 7700rpm! Torque, meanwhile, swells from 400Nm at 3900rpm to, ahem, 550Nm that is on tap whenever the tachometer needle is hovering between 1850rpm and 5500rpm. On a graph, think of its peak delivery as less of an angled ladder and more like a steep mountain that’s had its peak shaved flat. Remember that analogy as we introduce the Mercedes-Benz C63 AMG Edition 507 – now $159,507, or $12,900 cheaper thanks to a recent pricing restructure – in the first Australian comparison test between the two cars. (Incidentally, we also asked for an Audi RS5, but the test car was involved in an accident before we were able to collect it). Where the new M4 is the first of a new generation, the Edition 507 intends to see this 2008 C-Class out with a bang (pop, crackle and bark). It is the final car ever to utilise the Mercedes-Benz 6.2-litre naturally aspirated V8 engine also used in the SLS AMG supercar. The next C63 will follow the M4 (and its E63 and CLS63 siblings) and go smaller and turbocharged (but still with eight cylinders and 4.0-litre capacity). It uses forged pistons and a lightweight crankshaft from the SLS to help raise power from 336kW to 373kW, though it needs you to climb to 6800rpm to reach it. Torque moves from an already BMW-beating 600Nm to 610Nm that requires the throttle to travel far enough into the floor to see 5200rpm on the tachometer. However the C63 weighs 200kg more than the M4, at 1730kg, and with combined cycle fuel consumption of 12.1L/100km it is as ecologically credible as making a bonfire to burn carbon tax legislation. The prudent BMW claims 8.3L/100km combined. By the time we’re off the Monash and pause on Melbourne’s outskirts where great driving roads lie, the M4 has continued to draw us into believing its character is just one-sided. The sumptuous new cabin, with lashings of carbonfibre trim and stitched leather, large high-resolution centre screen, and deep bucket seats with an ‘M’ badge that illuminates in the dark, has a richness that implies this is a luxury model. The auto seamlessly upshifts to low revs to deliver that oh-so-good economy, and the engine note has a low-rev drone to it matched by wafting torque. The ride quality is superb, and seems nuanced enough between Comfort and Sport (there’s also Sport Plus) to suggest a certain sophistication, a finicky attention to detail from BMW M engineers. Time to take off the cloak. There are M1 and M2 buttons flanking the chubby three-spoke steering wheel, and the first is set for stability control on, drivetrain in Sport Plus (why would you want anything less than sharpest throttle? ), and steering and suspension each in Sport. The second preset is set to change the stability control to less restrictive M Dynamic Mode (MDM), with everything else in Sport Plus. Approaching the first corners of a familiar hillclimb (in the dry – the rainy pics were taken on day two) the M4 is fast like no M3 before it. Having outputs delivered early means the traction control light strobes to contain wheelspin under full throttle, but the BMW still hurls into the horizon to feel at least as quick as its 4.1-second 0-100km/h claim. Despite its extra grunt, AMG claims the C63 Edition 507 is a tenth slower to that speed. The front wheels of the M4 sit 34mm further apart than in the 435i, tucking under bulging front guards to create a tough, bulldog-like stance. Combined with serious grip from the 245mm-wide front Michelin Super Sport tyres, this BMW coupe shrugs off 45km/h-signposted corners as if they were mere kinks in the road. If you feel like you’ve gone in too hot, just keep adding lock and the M4 faithfully holds its line. Only twice did the Michelins start to make a distant howl as they were pressured into keeping the car between the white lines. The rear wheels, conversely, sit 9mm further apart than they do in the 435i, but the Michelin tyres are 30mm wider than those up front. With the stability control in MDM mode, the M4 uses its locking rear differential to help transition from neutrality, to slight oversteer, then to a big slide while keeping controlled and making the driver look like a champion. For all its accomplished cornering, however, it takes a drive on the same road in the C63 AMG Edition 507 to put a few things into perspective. Sitting next to the tough, slick BMW, the Mercedes-Benz appears like yesterday’s hero. It looks just like a two-door version of the seven-year-old C-Class sedan, and there are none of the lovely curves and haunches you get in the M4. Instead you get a grey sticker pack down the slabby sides of the car, and ostentatious bonnet vents from the C63 Black Series, just in case the regular C63 was too subtle for your tastes. If Benz did NASCAR, this would be its perfect entrant. Other racecar analogies continue to come to mind. The interior looks and feels as dated as the exterior, yet there’s a lovely Alcantara steering wheel and gearshifter, fantastic sports seats, an AMG dial on the console that allows you to scroll through C, S, S+ and M transmission modes, and an Edition 507 badge on the passenger side dashboard applique. You’d think the older Mercedes-Benz would lag behind for technology, but unlike the BMW it comes standard with adaptive cruise control, blind-spot assist and lane-keeping assist (the latter two are respectively $1000 and $900 options on M4). The C63 AMG Edition 507 has a smaller 7.0-inch screen, though its Comand infotainment system includes internet connectivity as standard, where a SIM card-based system asks $200 extra on its rival. The 8.8-inch BMW iDrive screen trumps its foe everywhere else though, including for optional connectivity that extends to a concierge service and ConnectedDrive Freedom apps, remote services and real-time traffic subscriptions. Other cool technology not offered on the Benz includes optional ($2360) adaptive LED headlights with auto high-beam that detects oncoming cars and blocks them out – very cool. The C63’s mighty V8 fires up with the ‘whumpf’ we’ve known and loved since 2008. It’s the immediate response through the throttle pedal that really grabs you though, even at low revs feeling as though your leg extends all the way into the engine bay with toes curled around the little wire tugging open its valves. Despite its immense torque and eagerness at low revs, the AMG engine urges you to chase its top-end, where the sound is pure and unadulterated. The way BMW M engineers have allowed a turbocharged six-cylinder to deliver crisp throttle response when the revs are hanging high is commendable, however compared with the C63 the M4 feels doughy at low revs. It’s not the torque delivery that’s the problem, because it soon comes on strong, but there’s not nearly the same immediate reaction from the engine when the throttle is quickly prodded. The M4 engine is quieter at low revs, too. It segues into becoming louder than the Mercedes-Benz at higher revs, yet it’s not exactly for the better either. Unlike the sweet, creamy, classically six-cylinder sound produced from an M235i turbo 3.0-litre, for example, the M4 sounds more hard-edged and meaty, but also grainy and a bit coarse. It’s almost as though M Division engineers tried to replicate the sound of the V8, or needed to make the new six louder to appease those who thought going turbocharged was a backwards step. However it’s come off sounding try-hard in the same way the shouty AMG four-cylinder in the A45 and CLA45 does. The M4 sounds awesome driving past our camera guys, but it takes dropping the windows for the driver to appreciate some of the aural drama. With glass closed, you can barely hear the whip-crack of the exhaust. The view of all our testers was that it’s a bit characterless inside – including our cameraman Mitch who has owned a Z4 and described the M4 engine as “like a BMW six with a hurricane on top”. The twin-turbo six also treads a fine line between linear delivery and feeling flat. BMW engineers have allowed this engine to rev well past 7500rpm, which is an excellent achievement, but (even noise aside) there’s little reward for travelling to those heights when peak power is delivered from 5500rpm. Keep the tachometer needle beyond that point, and there’s great throttle response but no real rush. Conversely, there is a great theatrical crescendo in the AMG, and you can meter out changes in its cornering attitude based on millimetres of throttle adjustment. It should be noted, however, that the BMW engine is fantastic in isolation, and only eclipsed by what is a supercar-like engine that is basically perfection. Less perfect is the Benz seven-speed semi-dual-clutch auto, which in manual mode is not as quick to respond to a hit of its steering wheel-mounted paddles as the BMW dual-clutch gearbox is. You have to pre-empt some upshifts before going beyond the 7200rpm redline, where in the M4 the ability to slap away at its paddles comes as easy as the supreme handling. 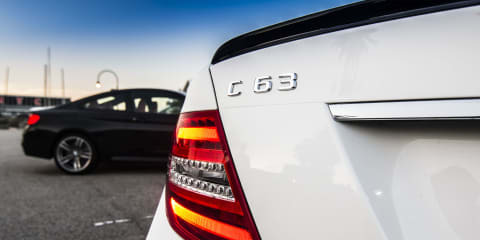 In the C63 AMG Edition 507 you have to be on your game. Likewise with its handling, though first I must digress and delve into history, because the C63 AMG and I have had a tumultuous relationship. Back in 2009 I was lucky enough to drive then-new C63 AMG and M3 sedans around Tasmania. The Benz felt roll-y and heavy, particularly at the front end. It destroyed its brakes and tyres trying to keep up with the lithe BMW, and its stability control was so overzealous you either had to bear its intrusion or switch it off and be in a perpetual state of fear. I even ran out of fuel in it. Last year, however, I drove the C63 AMG sedan, wagon, coupe and Black Series coupe back to back at Phillip Island raceway and was stunned at how much better the lower two-door is despite looking just like the sedan. Driving this C63 AMG Edition 507 on the road – now with Sport stability control, beefier brakes, lower centre of gravity than the sedan, revised suspension, and steering from the Black Series – I’m struggling to think of another model that’s improved over a lifecycle to such a degree as this Benz. The C63 AMG Edition 507 still cannot carve through corners as quickly as the new BMW M4. It feels a bit heavier, and its transition from front-end grip to rear-end slip is less delicate than in its rival, even with the optional ($4990) locking rear differential fitted to our test car, and throttle response sharp enough to leave your foot bleeding. Continuing the theme, however, the communication from the AMG’s chassis and steering makes the M4 feel a bit remote by comparison. The BMW’s steering is very accurate and nicely immediate just off the centre position. It is just like the steering in an M235i, really (and that starts to form another comparison). Unanimously, testers preferred the lightest Comfort setting as the weightier Sport and Sport Plus add heft but no extra sharpness. If ever you need steering feel in a car, it’s when you’re attempting to manage 550Nm-plus rear-drive coupes, and if ever there are two examples of the difference it makes, it’s with these two cars. The M4 can carve 45km/h-signposted corners brilliantly, but in super-tight 25km/h bends when you need to know when the front wheels are giving up purchase, the BMW electro-mechanical steering is mute. Cars with old-school hydraulic power assisted steering that send true road feel through to your fingertips are diminishing, but the C63 AMG Edition 507 is one of the last bastions of the breed. Its steering is sublime, its single setting perfectly mid-weighted and unbelievably crisp. It dances in your hands over road surface and camber changes, and when the front tyres start to scrub, your fingertips will get lovely little vibrations to indicate so. The C63 is possibly the most characterful, connected new car on the market, and while it remains a mighty beast, in its final incarnation it is far from untamed. Its tight front suspension means it no longer feels heavy and lurchy at the front, but rather sharp. The Sport stability control is as finely calibrated as the BMW’s MDM, and it allows beautiful flicks of the tail without becoming unruly. The other area where each car is a match is brakes, both equally powerful, responsive and fade-free. There’s no denying that you still have to push further into the C63’s reserves to keep up with an M4 that hammers out pace easily, however. In a case of déjà vu, some tyre wear was present on the 235mm front/255mm rear Continental ContiSport Contact Benz tyres following this test, and its fuel gauge was always showing a quarter of tank less than the BMW – at one stage we had covered 200km with only a quarter of a tank of fuel remaining. When the twists start to unfurl again, the Benz’s single suspension setting also lacks the depth of the BMW’s adaptive suspension on country roads. The C63 can feel so buttoned-down that gets bouncy, where the M4 in its ideal Sport setting is unflinching anywhere. Around town, though, the Benz improves, feeling hard but sophisticated and just liveable enough. These two are hounding each other to the wire. The BMW M4 is technically the better car, and it did indeed whip its cloak off and near-triple its original freeway fuel consumption. Compared with its older rival, it is just as fast but more efficient, has a better transmission, far more premium cabin, extra technology, superior ride comfort, it is quicker through bends and, subjectively, looks tougher. Yet in this company it is lacking the connection and character that separates the good from truly great sports cars. Where the M4 feels like a faster, larger version of the M235i, the C63 AMG Edition 507 is like a cut-price mini-supercar. Every tester walked away from it enamoured by just how special it makes you feel, from its bombastic engine to every control that talks to you, wherever you’re driving it and at whatever speed. It’s exactly enough to make you forgive its old cabin and hard ride. Photography by Mitchell Oke and David Zalstein.